Winter is just no fun. Salt, snow, and the cold make for undesirable conditions for Triumphs well except well-heated hardtop GT6s (not a chance). It is commonplace to store our summer friends for 6 months a year. It makes moving south for the winter to keep driving our cars almost understandable. Right honey? The following information and tips have been drawn from magazine articles, television shows, emails, and online boards. Some are useful, but many are contradictory. The main problem with storing a car for up to six months is the fact cars are designed to run on a normal basis. However, it is possible to store your car and limit damage. There is much debate about when to change the motor oil. The common solution is to change the oil and filter a day before you store your car. This ensures there are no acids to damage the motor during the lay up. However, some have made the argument that putting fresh oil in the car is pointless. The oil is going to sit all winter absorbing moisture, so unless you change your oil again in the spring you’re running with less then perfect oil. A TR4 owner suggested the third and more radical approach. His method is to drain the oil out of the system and add only enough oil to coat parts for storage. In spring, or if you plan on running the car during storage, be sure to prime the oil pump in the motor. Crank the starter with the main ignition wire off (so the car won’t start) until it has oil pressure. Once the oil and filter have been changed, run the car 20 minutes before storing. This insures all elements are warm and that the oil has been circulated throughout the system. Pour some oil through the spark plug holes into the cylinders. Replace the spark plugs with moisture plugs that are sold at any jobber or parts counter. Use an engine fogger to help coat all internal motor parts. Take the time to flush out your cooling system. Fresh coolant will protect your cooling system from rusting. Loosen off the alternator belt to reduce the stress on these parts. Allow the motor to fully cool before rolling the car into its final sleeping place. Dealing with the fuel system is a simple task. First if you know you are not going to be doing any serious work on the car, fill the tank full of fuel. This will avoid any water forming in the fuel. Add a high quality fuel stabilizer like Stabil to the fuel and run the car for about 5 minutes before storing. This will prevent the gas from "gumming" and turning to varnish. You may want to add a water evaporator/fuel line anti freeze solution as well. If you want, take off the carburetors and bring them in the house to ensure the seals don't go bad, then plug the intake to ensure nothing gets in there. One word. Clean. The key to a successful storage period is to put a clean car away. Clean body, chassis, motor, and interior parts will mean less harm to the car over a long period. From my research, I have found it would appear WD40 is a handy tool for coating parts. Several sources suggested WD40 on all the shiny bits, the outside of the carburetors, and a general spraying of everything in the engine bay to help protect parts. You may also consider lubing the brake discs with WD40 or coat them with Vaseline. Just make sure you clean them off in the spring. If you are concerned about moisture condensing on the motor, try covering the motor with a blanket. Oil spray the chassis and under body if possible. Most people suggest jacking the car up so the tires do not develop flat spots. Having the car up in the air allows better circulation of air under the chassis. Also attempt to park you car on cement (over a suitable vapour barrier). 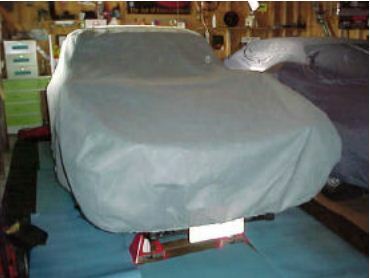 Do not cover the car because this can trap moisture unless you own a high quality cover. Don’t forget to remove the battery and be sure to thoroughly clean out the battery and battery box. Battery acid and dirt tends to build up eating away at the area. Rustproof the body as well. Many products are available at local automotive stores that will let you coat every small corner and cavity to prevent any new rust spots that may develop. Special attention should be paid to chrome parts. Use only “clear coat safe” products. Thoroughly wash and wax the cars body. Condition all weather-stripping with a good silicone conditioner. Lubricate all hinges. Wipe down all engine bay hoses with either a silicone conditioner or Armoral to prevent drying and cracking. A strong vacuum should be used on the interior to try and pull as much dirt up as possible. Treat leather and vinyl seats with a good conditioner/protection formula. Treat the dash and wood. Wash all interior windows. Remove antenna (if not retractable and you are covering). Treat tires with a non-petroleum based conditioner. Don’t forget those bumpers try black chrome. Regardless whether the storage is heated or not, moisture has to be able to escape. Use a dehumidifier, but only to keep the room at ambient humidity too dry and you dry out all the seals. Use mothballs for storage as well. Mousetraps ensure no rodents get into the car it has been known to happen. Attempt to park car on cement with a layer of thick plastic over the cement followed with cardboard or wood. Avoid carpet, which tends to hold water. Do not start the car during storage if it is only being stored for 4 - 6 months. This actually creates condensation within the engine and exhausts systems and accelerates corrosion. Maintain battery with a slow charger. During warmest period of the day open the garage doors to allow fresh air in. Rotate wheels to move grease around bearings. Be sure to test the clutch and brakes pedals. Shift the gears around to make sure they have not become stuck in place. Plug the battery back in and test all electrical systems; wipers, heater fan, radio, and lights. Bounce the car up and down to prevent shocks and struts from sticking. Change oil and filter. Run motor 20 minutes before storing. Let Cool. Remove plugs and insert moisture plugs. Pour some oil into the spark plug holes. Apply engine fogger. Loosen alternator belt. Clean the cooling system with fresh coolant. Keep a full tank of gas. Add fuel stabilizer in the fuel and run it a while before storing. Water Evaporator/Fuel line anti freeze. Watch humidity consider using a dehumidifier. Use mousetraps to ensure no rodents get into the car. Clean the car body with a car wash and wax. Condition all of the weather-stripping with silicone conditioner. Wipe down all engine bay hoses with a conditioner. Vacuum the interior. Treat leather or vinyl with a good conditioner. Remove antenna (if not retractable and you are covering). Treat tires with a non-petroleum based conditioner. Just before storage inflate tires to maximum recommended rating. Place a moister absorber inside the car’s cabin. Leave windows cracked just a bit. Attempt to park car on cement. Use a layer of thick plastic under the car. Place cardboard or wood over plastic. Use WD40 on most shiny bits and engine bay components. Use oil spray on the chassis and underbody. Use a cavity protection spray on all the hard to reach spots. Jack the car up on stands. Disconnect the battery and remove. Clean battery. Clean battery box. Cover car only with a high quality car cover, others may trap moister. Cover motor with a blanket. Lube the discs with WD40 or Vaseline. And finally at least once a month ... dream about spring.